West Bali is in Bali, Indonesia. This is the least populated and least visited region of Bali. It is dominated by the West Bali National Park and a huge area of protected reserve, much of which is completely uninhabited. Both the north and south coasts of this region offer quiet beaches but of a very different nature. Those in the north fringe calm seas which are excellent for diving and snorkelling. The southern beaches are wilder and include a number of renowned surfing spots. The town of Gilimanuk on the very westernmost tip of Bali is the departure point for ferries to Java. Two major roads lead into West Bali, one on the north coast and one on the south coast. The northern route links Lovina and Singaraja in North Bali to Pemuteran. This is a relatively quiet road which offers some great scenery and attractions en-route and visitors are advised to take it slowly. Much busier is the southern route as this carries the bulk of the commercial traffic to and from Java. This road links South Bali to Tabanan in Central Bali and then to the western region towns of Negara and Gilimanuk. A car journey from South Bali all the way to Gilimanuk will take upwards of 3 hours. Scheduled shuttle buses run from many of Bali's main visitor centres to Gilimanuk and these are widely advertised in towns such as Kuta, Lovina, Sanur and Ubud. Check locally and book one day in advance. Bemos servicing Negara, Gilimanuk and other parts of the south coast leave from Ubung terminal in Denpasar and Pesiapan terminal in Tabanan. Ferries run from Ketapang ferry terminal, Banyuwangi, East Java to Gilimanuk every 30 minutes, 24 hours a day. The journey itself takes about 45 minutes but loading and unloading may extend that time considerably. Since Bali has been the subject of terrorist interest from Java security has tightened enormously - be prepared for delays. This remote region of Bali lends itself to to getting around by hire car or motorcycle. Cars for rent are not all common here so best to bring it in with you from one of the main tourist destinations. You will find motorbikes easier to come by, especially in the beach communities of Pemuteran and Medewi Beach. 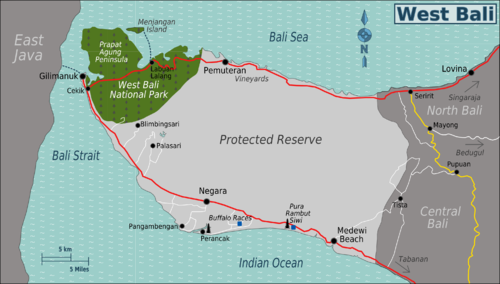 West Bali National Park covers some 770 square kilometres and is the dominant feature of this region. All visitors should check in and purchase permits (Rp 25,000) at the main park ofice in the village of Cekik south of Gilimanuk. Visitors intending to visit only Menjangan Island (part of the national park), please see below. For treks through forest and into the hills of the national park, proceed to the ranger station at Sumber Klampok about 20 minutes west from Cekik. A guide is mandatory and will cost between Rp 200,000 and Rp 500,000 depending on the length and nature of your trek. Discuss all of this and make plans with the staff at the Cekik park office. If you are very lucky you might get to see a Bali Starling, Bali's only endemic vertebrate species. Vibrant marine life. Uninhabited Menjangan Island is a renowned diving and snorkelling destination. This is part of West Bali National Park and boats with a guide can be chartered at Labuan Lalang just to the west of Pemuteran on the north coast. Dive operators in Pemuteran can arrange everything for you as well as other dive trips along this very attractive stretch of coastline. If the water does to appeal so much, then you can walk around in the island in about one hour and there are lots of good photo opportunities. Remote black sand beaches. The south coast of this region is fringed by black sand beaches and fishing villages that attract few visitors. The most well known of those is Medewi Beach. This is a surf destination but also a great place to experience laid back life in a tiny Balinese fishing village. Just relax and do not expect to see too many other visitors. On the north coast at Pemuteran there is a more developed but still very relaxed beach scene which centres on diving, snorkelling and marine conservation. Lots of accomodation options here to suit all budgets. Buffalo racing (Mekepung) in Delod Berawah about 9 km east of Negara town. Thought to originate in Madura, Java, the buffalo races were originally held as part of the harvest festivities in Negara. The colorfully decorated carts and buffaloes race on a four km course every 2nd and 4th Sunday morning starting at 7.00 AM. Rambut Siwi Temple (Pura Rambut Siwi). About equidistant between Negara and Medewi Beach. Located on a low cliff top overlooking a breathtaking panorama of paddy fields and the mountains of West Bali National Park on one side and black sand beaches on the other. The temple itself was built by the 16th century Javanese sage Dang Hyang Nirartha, also the creator of Tanah Lot temple. According to legend, he made a gift of his hair to the temple. Hence the name Rambut Siwi, which literally means ” Hair Worship”. Trekking and birdwatching in West Bali National Park are key activities in this region. You might, just might, even get to see a Bali Starling, one of the rarest birds in the world with just a handful left in the wild. Surfing is top class on the south coast beaches with the regional surf scene is being centred at Medewi Beach. Diving and snorkeling around Pemuteran and Menjangan Island rates up there with the very best in Bali. At the same time, get to learn about marine conservation initiatives for which Pemuteran is a key centre in the whole of Indonesia. A key culinary speciality of this region is Ayam Betutu (hot and spicy chicken). Chicken is boiled in a broth of local spices for up to 3 hours and wood-smoked (Betutu means smoked). It is normally served with steamed rice and plecing kangkung (hot and spicy spinach). This unique dish will certainly please foodies and even the most jaded of traveller will appreciate the truly delicious flavours. The recipe was apparently invented by the late Mrs Tempeh and the warung bearing her name is the most popular venue for this dish: Warung Men Tempeh in the old bus terminal at Gilimanuk. This is certainly not a region of Bali in which to expect any sort of bar culture. A beer on the beach is to be recommended though. A drive back to South Bali via Tabanan will take about 3 hours. The north coast route to Lovina and Singaraja will take about an hour. Ferries from Gilimanuk to Banyuwangi in East Java run every 30 minutes, 24 hours a day. This page was last edited on 28 March 2015, at 11:21.